Stretch marks are reddish, purple or pink (or sometimes brown, depending on your skin tone) depressed streaks that can be found on your breasts, stomach, buttocks, hips and thighs—to name just a few places where they commonly appear. Stretch marks are actually scars from your skin tearing as your body grows rapidly during pregnancy and can occur as a result of overstretched skin. Stretch marks are scars or disfiguring lesions. They are are not physically dangerous but can cause problems with self-image and anxiety. For some people, stretch marks are a significant cosmetic concern that can affect day-to-day social interaction. Maintain a healthy weight and Avoid yo-yo dieting. Eat a balanced diet. Vitamins A & C and minerals zinc and silicon can help support the skin. Once stretch marks occur, they are permanent. But the good news is that the appearance of stretch marks can be improved and blended to the surrounding skin. Puberty: Rapid growth is typical in young people going through puberty. 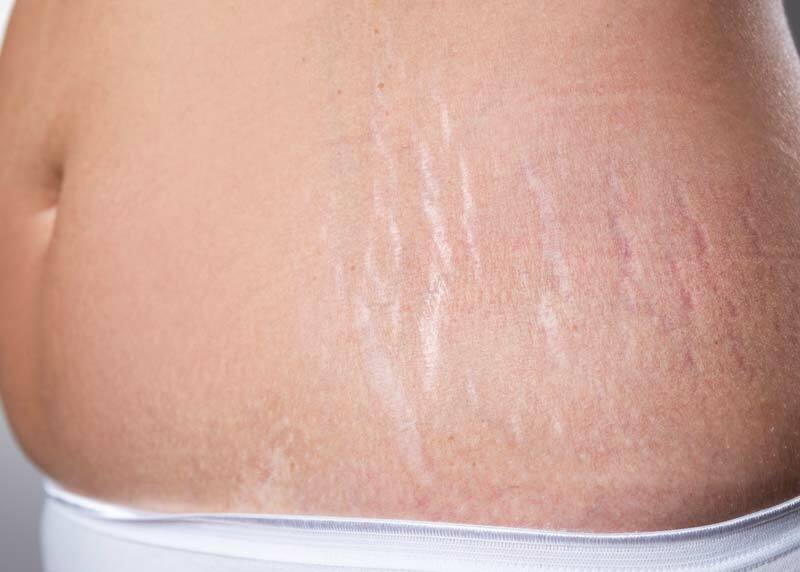 Medical conditions: Certain conditions can cause stretch marks. Corticosteroid use: Prolonged use of corticosteroid creams & lotions can decrease levels of collagen in the skin. During pregnancy, your skin is expanding at such a rapid rate—particularly during the sixth and seventh months—which can cause stretch marks. You’re also more likely to get stretch marks if you’re carrying multiples or a big baby or if you’ve gained weight quickly.Stretch marks can also happen with rapid weight gain or rapid muscle building from weight lifting, Genetics and hormones can also have an impact, so if your mother or sister got stretch marks, you probably will too. CAN YOU GET RID OF STRETCHMARKS NATURALLY? While you may have read online about how to get rid of stretch marks naturally using lemon juice, castor oil or even egg whites—the short answer is no, they don’t work. However Stretch marks can naturally fade in time & become less prominent. Laser treatments are considered the most effective for stretch mark removal, and there’s a good reason why: They force healing. Using a microfine laser to reach deep into the skin’s sublayers. This kick-starts the body’s natural healing process, removing damaged tissue and rebuilding it using fresh collagen—and revealing fresh, smooth skin in the process. That collagen will improve both skin texture and skin color, making stretch marks slowly disappear. While laser treatments are the best way to get rid of stretch marks—or more accurately, to help them fade— a combination treatment approach is the best. BBL lasers with Dermapen/microneedling and Carboxytherapy can build collagen and improve the texture of the skin, making it a little thicker. Stretch marks will never resolve completely, but they will be less noticeable if the colour and texture are blended to look more similar to the surrounding skin. The latest treatment which is proving to be very effective to treat the stubborn white stretch marks is the use of platelet-rich plasma (PRP) with microneedling or just injecting PRP directly into the area. PRP is a high concentration of cellular elements from your own blood that promote cell growth, tissue repair and collagen production. When PRP is used for scar reduction, your growth factors and stem cells work together to strengthen skin cells deep under the superficial layer of skin. The treatment targets skin laxity, hyperpigmentation and overall skin tone and texture. Essentially this means improving sagging, as well as colour and texture changes, to make skin look smooth.